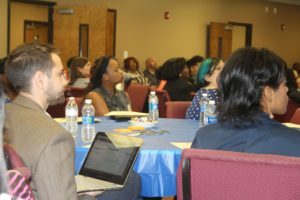 On August 10, nonprofits and educational institutions on the frontlines of community challenges gathered at the South Fulton Collective Impact Summit, hosted by The United Way of Greater Atlanta, to learn more about the United Way’s new Child Well-Being (CWB) index. The Child Well-Being index, developed in partnership with Neighborhood Nexus and the Atlanta Regional Commission, provides a set of common metrics to assess how children, the families that support them, and the community that surrounds them are doing. One speaker pointed out that the child in a community is like a canary in a coal mine. If the child is doing well, so is the community. If the child is doing poorly, the community is almost surely suffering as well. It’s a great metaphor and a comparison with which the TechBridge team passionately agrees. One Summit breakout session identified the ability to better collaborate and share resources as one of the distinct challenges in addressing education and career readiness. After having worked with around fifty nonprofit organizations on behalf of TechBridge, I can certainly attest to the importance of collaboration among nonprofits. And yet, virtually all of the nonprofits I’ve worked with on behalf of TechBridge came to us capturing program data with excel spreadsheets and manual processes. Imagine you work for a homeless shelter and have ten beds available, but fifteen clients walk through your door. What do you do with the additional five people looking for a place to lay their heads? Ideally, you could check a community database and point people to the nearest shelter with a bed available. However, if the shelters in your area track bed availability using spreadsheets (and perhaps update summary information into the state mandated Homeless Management Information System at the end of the month) there is no way to know which shelters have beds available unless you call each one. Take it a step further: Evidence-based best practices indicate that people need far more than a bed to break out of the cycle of poverty. Your shelter may provide some of these services, but likely doesn’t specialize in all of them. Where do you send your clients to get the additional help they need? Access to a community database would enable you to browse nearby service providers, check their availability, and (with your clients’ permission) share client background information to eliminate the need for the referral agency to capture information that you have already collected. United Way’s CWB index is a critical step forward towards community data sharing. However, until individual organizations improve their ability to capture, manage and report on their own data, there will be no effective way to begin sharing data that is accurate, timely and secure. So how do we get there? For starters, every organization needs a comprehensive plan defining the key performance indicators (KPIs) they need to track and the necessary investments in technology to effectively track these metrics. TechBridge calls this plan an IT Strategy. Nonprofits then need to successfully execute technology projects to develop and adopt new solutions internally. During this process, nonprofits should hold open discussions in their communities on what data to share and what data to keep private. Once this foundation has been laid, the vision for an open community database can become a practical reality. This post was contributed by TechBridge Nonprofit Operations Consultant Sean Williams.